Update (April 19, 2010): The print issue of Wine Spectator containing a 95-point rating for this wine is arriving now and checks on Wine-Searcher.com reveal very little if any of this wine remaining on retailer shelves. I'd love it if you subscribed to this site so we can discuss future value plays before they're sold out. 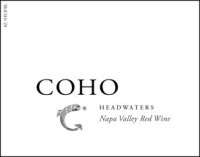 Coho Headwaters Napa Valley Red Wine is a quiet little bottling in terms of production levels and mainstream awareness, but for those who follow Wine Spectator's ratings, it might just be the best recently released Quality-to-Price Ratio wine from Napa Valley. Created by wine industry veterans Brooks Painter (Mondavi, Stag's Leap, V. Sattui) and Gary Lipp (Heitz, Mondavi, Chappellet), the wine is a blend of Cabernet Sauvignon, Merlot and Petit Verdot. Production levels have gradually increased from 776 cases in 2005, followed by 1,336 in 2006, and 1,714 in 2007. In terms of ratings pedigree, Wine Spectator rated the past three vintages 92, 95, and 95 points. That in itself is impressive but at a consistent release price of $40 this wine is attaining ratings normally reserved for wines well over $100 a bottle. The average Spectator rating for a 2006/2007 Napa Cab with a rating of 95 or better (excluding this Coho) is $156. Those wines range in price between $62 and $325 a bottle. I'm not saying $40 is a cheap bottle of wine- I'm just saying that relative to the quality of this wine, it's a stunning value. I think Spectator got their positive impression of this wine absolutely right: It's a beauty. It's not ridiculously big and dark, but it's wonderfully aromatic and flavorful. Ripe blackberry/raspberry aromas accompanied by milk chocolate. A little vanilla too. On the palate I really enjoyed the firm backbone and vibrant fruit. Incredible finish. Truly, one of the best values going in Napa Cab right now. Very highly recommended if you can find this (or the more highly acclaimed '07 vintage) south of $35. Act quickly. I thought the wine was amply aromatic from the moment I opened it. Classic Cabernet characteristics like blackberries and black currant on the nose. Complemented by a very enjoyable mocha streak on the palate with fine-but-sweet tannins. Some caramel reveals itself after some time. Such a delight to drink. The kind of wine you'll be sorry you didn't buy more of. The 2007 vintage could be every bit as good or better than the 2006. But only time will tell. Either way, it's a great wine for the money. The importer in Massachusetts is the Wine Pro: (781) 595-4796. I called a few weeks back and availability in the state was unclear. I hope to see some in stores soon. Question of the Day: Have you tried this wine? If so, what did you think? Either way, have you seen it on shelves in a store near you?